Over 260 people attended the FVC 8-Year Sponsors’ Day Mass at SMA House, Claregalway on Sunday, 1 September. The Chief Celebrant was Fr Dominic Maria Anthuvan, an Indian SMA priest on a visit from his mission in Kontagora Vicariate, Nigeria. He was assisted by Fr Malachy Flanagan (Vice Provincial), Seamus Nohilly, Brendan Dunning (FVC Director), Martin Costello, John Dunleavy, Phonsie Flatley (on holidays from Nigeria), Eugene McLoughlin and Gerry Sweeney. They are pictured here with Fr Dominic during the Mass in the Hall at the SMA House. The Thanksgiving Mass was to celebrate the ordination of 25 new SMA priests, coming from Poland and several African countris. In the Souvenir Brochure for the occasion our Sponsors were able to see the photos of some of the 2013 Ordination class. In his homily at the Mass, Fr Dominic reminded our Sponsors of the essential role they play in spreading the Good News to people in different parts of Africa. In just 20 years, the FVC has helped support – by prayer and financial help – over 200 new SMA priests. Most of them are now on mission in 15 African countries; some are involved in Society administration. Two of them are now bishops in the Central African Republic. Among those at the Mass were Matt and Kathleen Cunningham with their daughter Ita and (proud Galway supporter) grandson Mark. 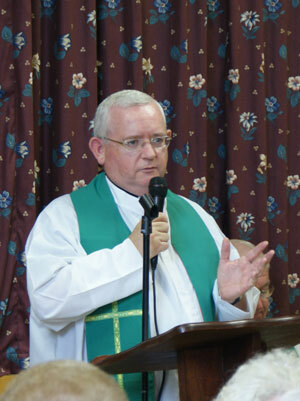 The Family Vocations Crusade (FVC) in the west of Ireland has more than 2,300 members gathered into 200 Sponsor Groups. The members commit themselves to pray for Vocations to the priesthood and religious life, particularly for the missions and to support financially the training costs of SMA seminarians, of which there are more than 300 at different stages in their training. The Society has 15 Formation centres, in Poland, India, Philippines and in nine African countries. Most of the staff in these Houses are among those ordained since 1992, when Fr Michael Adrie (from Ghana) became the first priest of the SMA African Foundation. We now have 175 African SMA priests. Surely a blessing on the work of the early missionaries and those who made the decision (in the 1950’s) to admit Africans into the SMA. Heretofore, the SMA always encouraged young men to join their home diocese in order to participate in building up the Local Church (one of the four aims of the SMA Founder, Bishop de Brésillac). But the Society did not implement the decision until the early 1980’s. By that time many African bishops were saying that they wanted to be part of the missionary work of the Church. Despite still not having enough for their own needs they were happy to see the SMA – who were the original missionaries in their areas – welcome and train ‘African’ missionaries who would go to other parts of Africa to preach the Gospel. Fr Dominic is pictured with Anne Garrett (from Claregalway and a niece of the late Fr Laurence Dolan SMA), Kathleen and Viola Lowry (from Tuam). Since his arrival in Ireland from his parish in Nigeria, Fr Dominic has celebrated Mass for our Sponsors who gathered at the Community Centre in Fourmilehouse (Co Roscommon) and at the Fahy Hall in Roslevan parish (Co Clare) where the Bishop of Killaloe, Rt Rev Kieran O’Reilly, concelebrated with him. As SMA Superior General it was the then Fr Kieran O’Reilly who admitted Dominic to Permanent membership in the SMA and ordination. Our picture shows Fr Malachy Flanagan (SMA Vice Provincial) thanking all for coming to the Mass and for their support down the years. Some of the Sponsors who were present have been part of the FVC for more than 35 years. Like any good missionary, and echoing the words of Fr Dominic and Fr Brendan, he urged them to continue. It is a fact that most of our new priests would not have the financial and other resources to go to a seminary. It has always been the SMA policy to accept suitable candidates for the priesthood and to seek the necessary funds from our supporters to cover their education and living costs. Thank God we have been blessed with thousands of good people who support this work. Click here for further information on the FVC and their work. After the Mass and presentations we all had an opportunity to meet and chat with the SMA community, other visiting SMA priests and also with neighbours and friends. Our picture on right shows some of the team who prepared sandwiches and cakes for us all and served the teas etc. Pictured are the three Anne’s, Bridie, Peggy and Bernie. To them and those not in the picture: Go raibh míle maith agaibh! E se pupo (‘Thank You’ in the Yoruba language). Thanks too to Martina and Madge, in the Claregalway Office, who look after all our callers during the year. and be within you, to enlighten you and fill you with his Peace. Amen.